Assemblyman Karl Brabenec (R,TCN-Deerpark) [at podium] today joined legislators and construction workers at an Albany rally to call for increased funding for local roads and highways. 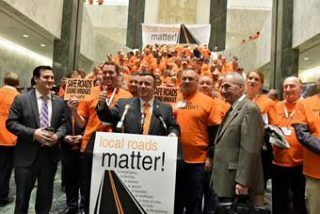 Assemblyman Karl Brabenec (R,TCN-Deerpark) joined legislators, highway officials and construction workers from across the state at a rally Wednesday in Albany to call for a $150 million increase in the Consolidated Local Street and Highway Improvement Program (CHIPS) and additional funding for the PAVE-NY program. These state programs are a main funding source for local governments to make routine road and highway repairs, but CHIPS funding has remained stagnant in recent state budgets.